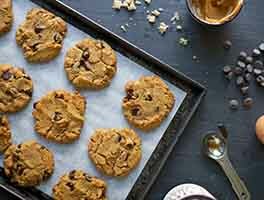 Pools of melty, chocolate-y, peanut butter-y goodness in a scrumptious chocolate cookie. 7 mins. to 9 mins. In a medium-sized bowl, whisk together the flour, cocoa, baking soda, and salt. In another bowl, beat together the sugars, butter, and peanut butter until light and fluffy. Beat in the vanilla, egg, and water, then stir in the dry ingredients, blending well. Stir in the mini peanut butter cups. Scoop rounded tablespoonfuls of dough onto the prepared baking sheets; a tablespoon cookie scoop works well here. Flatten each cookie to about 1/2" thick. I made this first as written and really liked the result (I did use peanut butter chips instead of the mini PB cups) but was wishing for a little more pronounced chocolate flavor. Next round I used 1/2 butter and 1/2 shortening with 1 tsp espresso powder and 1/2 chocolate 1/2 peanut butter chips. They did not need to be flattened before baking. This was the ideal texture and flavor balance for me. 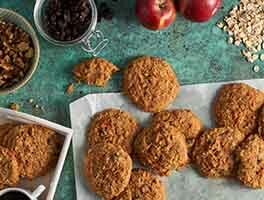 I made this recipe on a whim and took it to a homeschooler gathering with lots of kids - it was a huge hit with some of the kids declaring these the best cookies they've ever had. I did make a substitution: I used caramel chips & some mini chocolate chips in place of the peanut butter cups simply because that was what I had in my pantry. These cookies were amazing! I took them out of the oven after 12 minutes and let them set for a few more minutes and they were so soft and gooey! After cooling completely, they had firmed up to the perfect texture! I used organic chocolate chips instead of the mini peanut butter cups (based on the unclean ingredients that we don't consume). I was afraid the peanut flavor would be lost, but it came through very nicely! I will make these again, but probably play around with reducing the amount of sugar since they are very sweet (personal preference). Yummers! I made only three changes. 1 1/2 cups Reeses peanut butter chips instead of mini-peanut butter cups. 3/4 cup brown sugar instead of 1/2 cup white & 1/2 cup brown sugar. 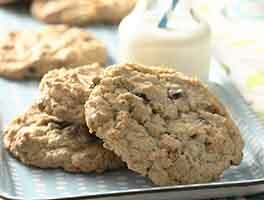 1/2 cup KAF white whole wheat flour for 1/2 cup KAF all-purpose flour. Chilled the dough. These did not spread out much at all. They came out like a cross between a cookie and a really rich brownie. Awesome. These turned out great. My family loved them. The only substitutions were peanut butter chips instead of the mini peanut butter cups and salted butter instead of unsalted butter, as those were the ingredients on hand. I reduced the salt because of the salted butter. Just baked them today and there are just a few left. Another great recipe. Thank you! PERFECT! 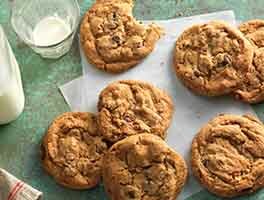 These cookies are delicious and soft with a creamy peanut butter texture and phenomenal peanut butter flavor. I used the mini peanut butter cups available in the bulk aisle of a local supermarket and followed the recipe to exact specifications. I made no substitutions or modifications and will continue to make them as written. Also, these cookies get softer with time, so if you like soft-batch cookies, then these are for you. These cookies are amazing when warm! I couldn't find mini peanut butter cups where I am, so I used peanut butter chips. 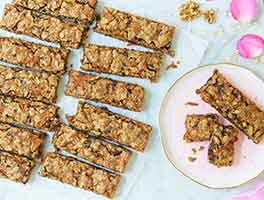 A few reviewers thought the cookies were dry and crumbly - I think that would happen only if you didn't flatten the cookies per the instructions. I was nervous about them turning out that way, so I baked for just 7-8 minutes, and they turned out great. This is a great cookie dough but the fact that the peanut butter cups have hydrogenated fats in them is unconscionable. Charge more but use ingredients known not to be harmful!! I substituted dried cherries as I simply could not bring myself to use the pb cups. 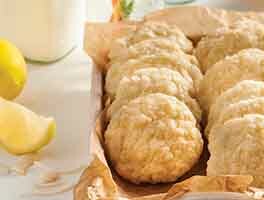 These cookies are a huge hit every time I make them! I use a small cookie scoop, a bit overfilled, and then bake them no more than 9 minutes, in my convection oven. I highly recommend watching carefully so they are barely past being shiny wet in the cracks that might appear- just "set", so they are still soft after letting them cool on parchment lined sheets. They are best the first day or two. Using Reese's brand mini cups is good, but I like the really mini cups I get in bulk at local "natural" type supermarket, as there are more cups per cookie. Thanks for another great recipe, KAF!